Can you bloomin believe its August already? I know its the old beauty blogger cliche to say 'where on earth did this past month go' at the start of every monthly favourites post but seriously, where did it go? I feel like this summer has absolutely flown by and it'll be Christmas again before we know it, eep! The weather has been fabulous too hasn't it? Every time I step outside I feel as though I'm stepping off a an aeroplane in some exotic country (I wish!) which is so unusual for the UK. I can't remember the last time we had a proper summer like this! July was a pretty busy month for me as I celebrated my 23rd birthday, went to T in the Park and to Clitheroe for a wedding. Its safe to say I haven't stopped most weekends so its been nice to well and truly chill this weekend and have some time to get my blog on. I'm hoping to get a few posts wrote today for the week ahead so I'm not so stressed trying to juggle my full-time job and blog posts during the week. Fingers crossed! Anyway, before I start rambling, I want to share some products I've been loving for the past month. There isn't many as I've been sticking to the same products most days but there is a couple of products in there that I've not mentioned before and a couple of old favourites too! Since the release of Clinique's 'Chubby Sticks' it seems every high street brand has jumped on the bandwagon and created their own version on the infamous lip crayon. The latest offering comes from Bourjois and their Colour Boost lip crayons. 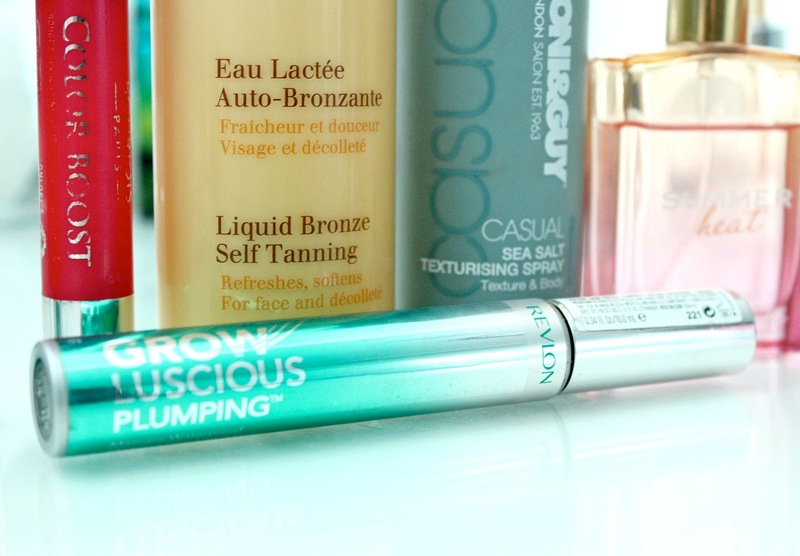 Bourjois have been on a roll with their product releases recently so I couldn't wait to get my mitts on them and I wasn't disappointed. I've reviewed them in full here so I won't ramble about them too much but if you like easy to use lip products that provide a wash of colour and a glossy finish, you'll love these lip crayons. I've got three of the four shades available and the two I've been reaching for daily are 'Peach on the Beach' (how amazing is this name?) and 'Fuchsia Libre'. They're perfect for throwing in my handbag and slicking on when I'm in a hurry. Ooh, I do love a bit of fake tan. I don't wear it every day but when I'm going on a night out, I like to make sure I'm tanned as it makes me feel more confident, especially if I'm getting my pins out in a dress or skirt. However, one thing I always struggle with is tanning my face. I have no idea why but regular fake tan always tends to go patchy and makes me look dirty instead of sun-kissed. Not a good look! With this being said, for quite some time, I've avoided putting any tan on my face and stuck with bronzer instead. Well, until now that is. I was recently sent the Clarins Liquid bronze self tanning to try out which is specifically designed for the face, neck and décolletage and its absolutely amazing at providing my face with a natural looking tan. Its a white lotion that's applied to the skin like a regular moisturiser and it sinks in within minutes. I tend to apply it just before bed and when I wake up in the morning my skin has a nice olive tone to it and looks much more radiant and glowing. I'm going to review this product in full soon along with a couple of other Clarins products so do keep your eyes peeled for that. This product has been my most used hair product of the summer and I absolutely love it for giving my hair texture and an effortless 'tousled' effect. If you've never used a sea salt spray before, the purpose behind them is to give your hair texture, hold and beach waves. It can be sprayed onto wet hair or dry hair and my favourite way to use it is when my hair has just been blasted with the hairdryer and is still slightly damp on the ends. I spray it all over the mid to end lengths, scrunch my hair between my fingers and leave it to dry naturally. Once its dried I'm left with pretty natural waves that required no effort at all. This was my go-to hairstyle on my holiday to Marbella in June as the last thing I want to do when I'm in a hot country is use heat on my hair. I'm sure I'll be taking a bottle of this to Portugal too! Although its not the most obvious place to buy perfume, when I was younger I used to always buy various fragrances from Next. I think I got into them after smelling one my mum used and absolutely loving it. I remember my favourite was called 'Paradise' and although it only cost about £5 for a small bottle, it was my most worn perfume ever as a teenager. Anyway, before I start getting all nostalgic on you, let me tell you about the most recent Next perfume I've tried, 'Summer Heat'. I received it last month as part of my birthday present from my Nanna and I've been wearing it almost daily since. I'm rubbish at describing scents but its very fruity, sweet and fresh and reminds me of being on an exotic beach somewhere. I love the little pink and orange bottle too - it looks pretty on my dressing table and is great for throwing in my handbag or travelling. Next time you're in next (no pun intended haha! ), make sure you give it a whiff! MAC Impassioned is one of the first lipsticks I ever bought from the brand and its one I used to wear religiously when I first bought it. I wore it so much in fact that I got a bit sick of wearing it and it eventually got forgotten about amongst my stash of other lipsticks. However, I saw it amongst my lipstick collection recently and remembered how much I used to love it so I thought I'd give it another go. Well, its safe to say my love for it is well and truly back. I wore it on a recent night out and its the perfect bright fuchsia pink shade for the Summer. I absolutely love the Amplified Creme formula of this lipstick too (its my favourite MAC formula) as its unbelieveably creamy and pigmented without being drying on the lips. Its long-lasting too which is another bonus and generally a very beautiful lipstick. I reviewed it in full here if you want to see how it looks on. 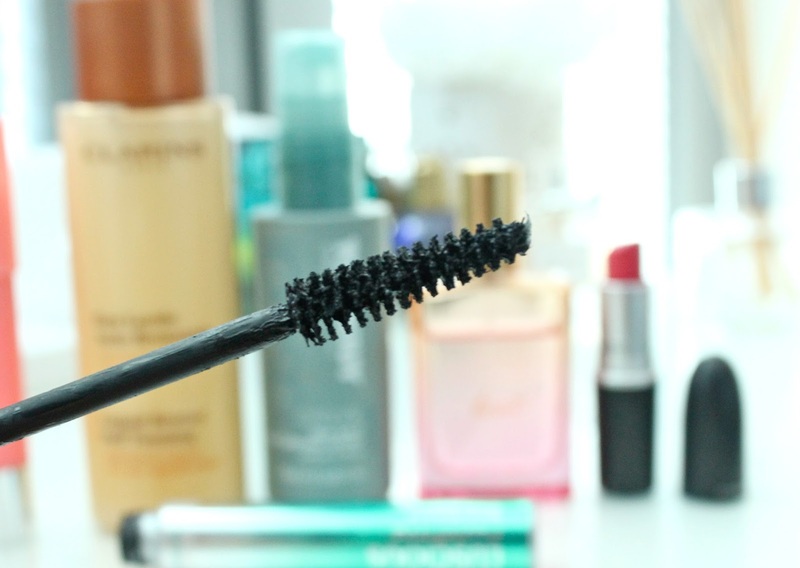 When it comes to mascara, I'm never faithful to one and usually have a selection of them on the go at once. I'm not sure why, I guess I'm just always on the hunt for something better and with the amount of new mascaras released, its hard to not be tempted. However, one mascara I've repurchased again and again is the Grow Luscious mascara from Revlon. I discovered it when I was out in Australia last year and it really helped to get my eyelashes back in good condition after a disastrous experience with eyelashes extensions. I won't say too much more about it as I've reviewed it in full here but I'd really recommend trying it if you like full and thick lashes. The soap and glory spray in Boots is quite for this as well and it's only £3.50! I never got on well with the Revlon mascara- it clumped dreadfully, but too much product ame through. Great post! 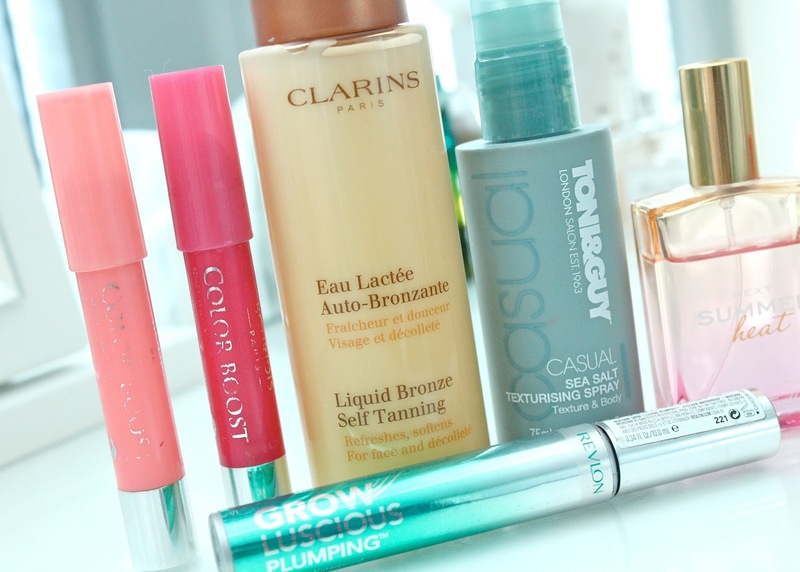 I've seen so many people mention the Bourjois lip crayons and I really need to try one out! Absolutely love the Bourjois lip crayons.. so amazingly hydrating. 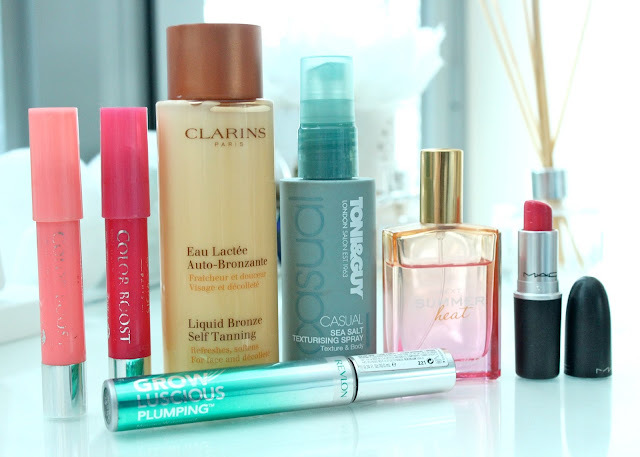 The clarins liquid bronze is amazing! 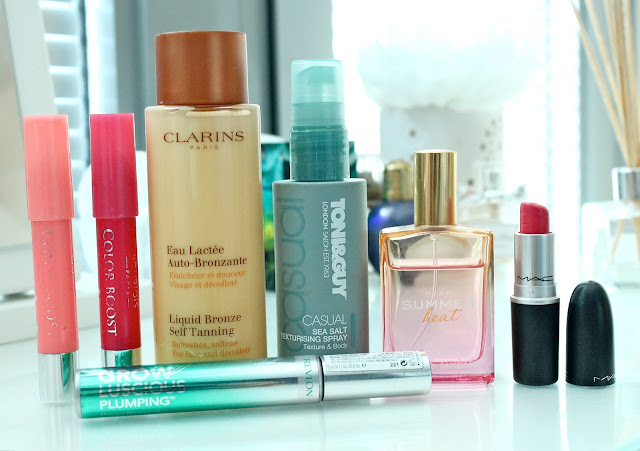 It was in my June favourites last month! I love it! Use it around 3 times a week and gives me a healthy glow! Also find it doesn't brake me out in spots! Ah brilliant, I've been looking for a salt spray for a while, I'll give the Toni & Guy Sea Salt Spray a try! After recently getting my hair cut Im still experimenting with what to do with it! I think this could be a great solution :) Thanks! I really want to try the clarins self tanner & peach on the beach looks lovely, both added to my wishlist! Everyone raves about the clarins tanned, I think it's time I invested in it! Love the shade of that Mac lipstick too. I need to try this Clarins self tanner, it seems to be everywhere with great reviews! I really need to try the lip crayons! The Clarins fake tan looks gorgeous! Well, all those products look amazing! Thanks for such a great post! MAC impassioned looks really lovely! I love the Bourjois crayons too! Impassioned looks like a lovely colour! I've never tried any Revlon mascaras but I think I might have to now! I've been loving peach on the beach too, such a pretty colour! Impassioned is one of my all time favourite shades! I love it. I know most people would describe where i come from as exotic (i'm from Indonesia), while usually we have summer all year long (with rainy season), the weather's been crazy unpredictable this year, we actually had a proper summer in my hometown for only 2 weeks this year! Crazy rain, lots of thunder storms and a much cooler temp than usual is suddenly happening every other day! My friend from UK just visited a few weeks ago n she said it's ironic (when she checked he iphone) that the weather in UK was actually hotter (31 celcius) than in Indonesia (that ranged from 26 to 29 celcius all through her visit)!! Didn't even know Next has perfumes! That's one Next's stores here does 't stock! And love those lip crayons! Really loved the shade of the mac lipstick! I'm loving the Bourjois crayons, wish they came in more colours! MAC Impassioned looks like such a pretty colour, as do the Bourjois lip crayons! I'm also looking into getting a salt spray, so thanks for the help! 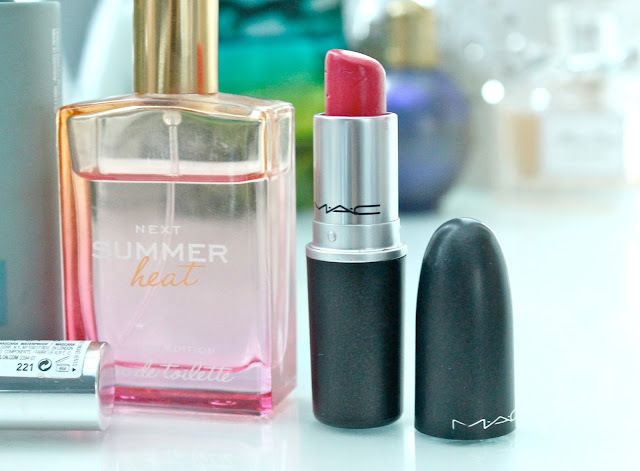 Im a definite fan of Mac impassioned; I think it's the perfect bright lip for summer! Lovely blogpost and Mac's impassioned looks amazing! Great things on here. I;ve been wanting to get the Borjouis colour boost crayons for ages! Impassioned is next on my (HUGE) wish list of Mac products. 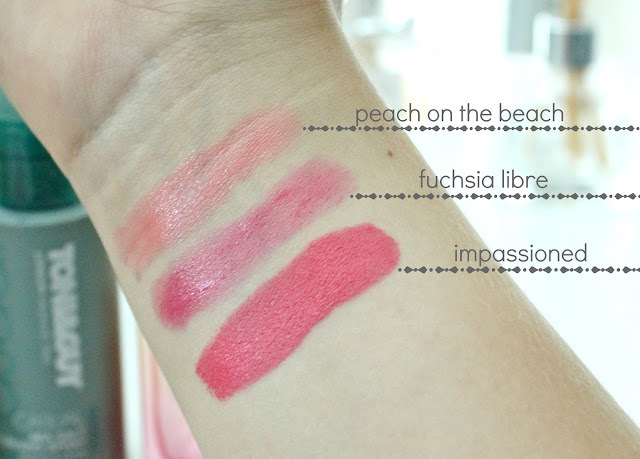 I also really want to try those lip crayons, I swatched them a few days ago, and the colours are so pretty!